Seekkuge Prasanna will play no part in Northants’ NatWest T20 Blast title defence after being sidelined with a hamstring injury. Prasanna, who helped the County claim T20 glory last season, was initially set to be available for all 14 of the Steelbacks’ North Group games. But his return was delayed by international commitments as he represented Sri Lanka in an ODI series against Zimbabwe. Prasanna then suffered a hamstring problem, with South Africa spinner Tabraiz Shamsi continuing to stand in for the 32-year-old. But though Shamsi remains available for this week’s away clashes with Leicestershire and Nottinghamshire, he will be jetting off to play in the Caribbean Premier League on August 4. 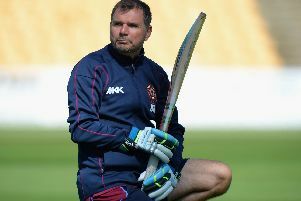 That means Northants will be without both Prasanna and Shamsi, but head coach David Ripley is confident his squad can cope. “We are disappointed that Seekkuge is not joining us this season, especially as it’s happened quite late in the day,” Ripley said. But there is better news in the batting department as Richard Levi has recovered from concussion and is now available to make his first appearance in this season’s T20 competition. The 29-year-old had been sidelined since receiving a blow to the head in the Specsavers County Championship Division Two match against Worcestershire in May.